TireCare Sealant is the only permanent tyre sealant solution, offering you a constant peace of mind when on the roads. If you ever had a tyre puncture, you know that it's a harrowing and annoying matter. The car starts to wobble, the steering goes off, and you curse and swear and ask yourself why this has to happen to you, especially if you are in a foreign land. 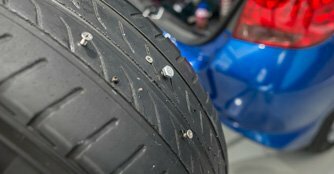 How many people actually know how to fix a tyre puncture? After all, it's not a skill that is taught or regularly used, so you can't be blamed if you've never touched a car jack and tyre wrench before. Of course, you could (and probably will) call a tow truck if the puncture is serious and the car cannot be driven anymore. But what if we told you there was another way? The alternative is to use a tyre sealant. For most people, the notion of a tyre sealant is a temporary fix until you can get the tyre replaced. Now, TireCare is introducing a new kind of tyre sealant that promises to be a big problem solver - a tyre sealant that offers a permanent fix. TireCare Sealant is made using natural rubber latex, plant extract and nano fibre. It is a completely organic and eco-friendly product that is non-toxic, non-hazardous and non-corrosive. As a result, it does not damage your tyres, rims or tyre pressure monitoring system. The sealant works using centrifugal force (as the wheels turn when you are driving) to coat the entire inside surface of the tyre. When there is a puncture, the nano fibre in the sealant will react with the rubber to seal up the puncture wound. And unlike temporary sealant, which requires you to change the tyre as soon as possible, TireCare Sealant allows you to carry on using your tyres as per normal. The sealant is also capable of dealing with multiple punctures. Tyre Sealant Anyone Used Before?